Q. How do I join Lucy Pet Rewards? Q. How will I know if I’ve earned a reward? Log into your Lucy Pet My Rewards account to view your points balance. Some points, such as referrals will not show up until the person accepts your referral. Q. I have questions about my Lucy Pet Rewards Account or the program. Q. Is there a maximum amount of points that can be redeemed in one order? Q. Do my Lucy Pet Rewards Points expire? Points and Rewards expire one year after they are earned, or if an account has been inactive for 12 months. Your account is deemed inactive if there have been no log-ins in a twelve-month period. Q. How do I know what items can be purchased with Lucy Pet Rewards Points? Visit our Rewards Claim Page (redemption page) to purchase a free product when you have enough points in your balance. Q.How do I participate in the Buy 12 Get 1 Free program? Q. Do I have to make a purchase to join or earn rewards? 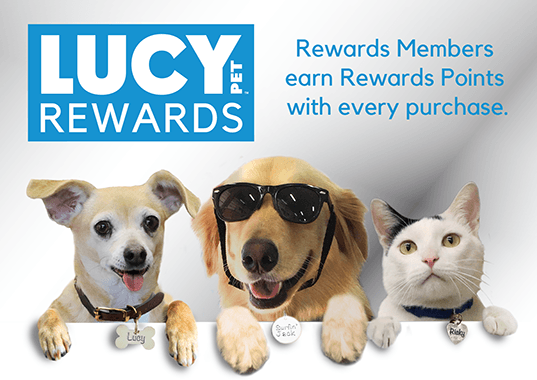 No purchase is necessary to become a Lucy Pet Rewards member. An email address is required for a member to receive Lucy Pet Rewards communications and earn Rewards points. You must be 16 years or older to participate. Q. How do I earn Lucy Pet Rewards? Q. How do I redeem Lucy Pet Rewards Points? Once you earn enough Lucy Pet Rewards points, you can select a reward to redeem. Options include items from the Redemption Page, or designated products in the Rewards Claim Page (redemption page). During the checkout process, apply your Lucy Pet Rewards points and continue to check out. You may be required to pay for shipping costs, as applicable. Note: Points will not be earned for the portion of any transaction that was paid for using Lucy Pet Rewards points. Q. What will I be able to get with Lucy Pet Rewards Points? You can redeem your Lucy Pet Rewards points for items listed on our Rewards Redemption Page, or to purchase a free product in our online shop when you have enough points in your balance.